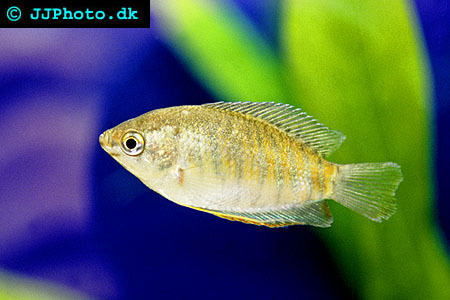 Company: Trichogaster labiosus (Thick Lip Gourami) is suitable for community aquariums. Aquarium setup: Trichogaster labiosus (Thick Lip Gourami) should be kept in densely planted aquarium with open areas to swim on. Provide them with floating plants. They live in slow moving water in the wild so it is recommendable to avoid heavy circulation in the aquarium. 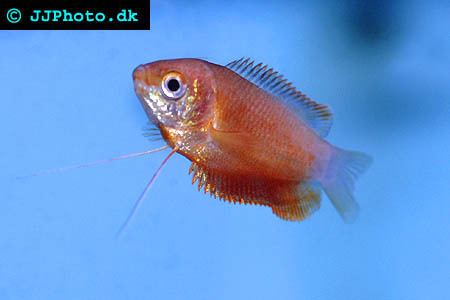 Feeding: Trichogaster labiosus (Thick Lip Gourami) eats flake food. Breeding: Trichogaster labiosus (Thick Lip Gourami) is bubble nest builders. The males build the nests on the surface among floating plants. The build very instable nests and filtration should be avoided/turned off during the breeding. The male will guard the nest from all other fishes including the female once the eggs are laid. He guards the egg and fry until they become free swimming.